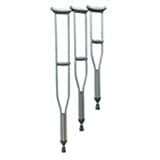 Constructed of strong, lightweight aluminum and has large, non-skid rubber crutch tips and comfortable, durable rubberized foam underarm cushions and handgrips. The center tube has a double push-button height adjustment in 1" increments. 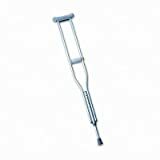 Crutches come completely assembled with all accessories, instructions and a lifetime warranty. Underarm and handgrip pads are comfortable and durable. Includes laminated color operating instructions. Maximum Weight Capacity 300 lb - EVENLY DISTRIBUTED. Designed to meet the requirements of HCPCS code: E0114. 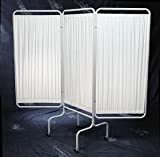 This screen features flame retardant, bacteriostatic 6-mil white vinyl curtains and high-strength round tubular all-steel frames. The lightweight panels have riveted hinge joints, extra-wide base, removable spring rods and measure 27" x 69" each (68 x 50CM). Available with rubber feet & casters. Ace Crutch Or Cane Tip Fits 3/4 - 7/8 Dia. Beige Carded/2 Discovery Con, Nbr, Sup, Hwu Price is indicated for bulk discounted quantity of 6 unit(s) per case.